Traumatisme unveils the "Never-Never Land" music video! Traumatisme is proud beyond words to unveil the Never-Never Land music video! The black and white short film is, as usual, total D.I.Y. and produced, directed, edited and performed by Traumatisme. So close the shutters, switch off the lights, turn up the volume really loud, and let the show begin! Never-Never Land is the first single from Traumatisme's new album Paper Monsters, which will be available on May 31, 2017. 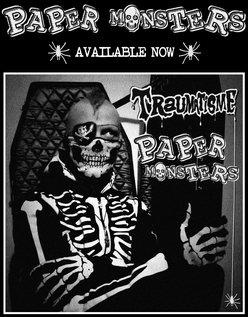 Paper Monsters will be available as a free download, and also on Traumatisme's YouTube channel. The CD edition of the album will be strictly limited to 100 copies, so be sure to pre-order yours at the online store!